Be the first to share your favorite memory, photo or story of Wilbur. This memorial page is dedicated for family, friends and future generations to celebrate the life of their loved one. 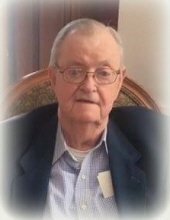 Wilbur Eugene Allen, age 87 of Carrollton, passed away January 20, 2019. He was born September 5, 1931 in Carroll County, Georgia, second of five children to the late McCurdie Allen and Ellen Williamson Allen. He was a Mt. Zion High School graduate and proudly served in the United States Army during the Korean Conflict. During his younger years, he enjoyed camping, fishing, going to horse shows and riding his Harley Davidson. He lived in the New Hope Community for more than 62 years. He retired following a lengthy career from Gulf Life Insurance. After retirement, he enjoyed meeting his friends at the Carrollton Burger King for Breakfast and Bowdon Wendy’s for afternoon ice tea. In his later years, he enjoyed watching RFD cattle sales and the rodeos. In addition to his parents, he is preceded in death by his wife of 50 years, Martha Jo Johnson Allen; daughter, Janice Elaine Allen; four siblings, Elizabeth, Ruth, Charles and Ray Allen. He is survived by his daughter and her husband, Deborah Allen Wadsworth and Maybank Scurry of the US Virgin Islands; a number of nieces and nephews; and his caregiver, Kimberly Brown, who has been with him for the last ten years. The family will receive friends at Martin & Hightower Heritage Chapel Wednesday, January 23, 2019 from 5:00 PM until 7:0 PM. In keeping with the family’s wishes, his body has been cremated and inurnment will be in Shiloh United Methodist Church Cemetery. In lieu of flowers, the family requests that donations be made to the Mt. Zion High School, ATTN: Athletic Department in Memory of Wilbur Allen at 280 Eureka Church Road, Carrollton, GA 30117. Messages of condolences can be sent to the family at www.martin-hightower.com . To send flowers or a remembrance gift to the family of Wilbur Eugene Allen, please visit our Tribute Store. Cremation will take place and no service will be scheduled at this time. "Email Address" would like to share the life celebration of Wilbur Eugene Allen. Click on the "link" to go to share a favorite memory or leave a condolence message for the family.